Britannia has built iconic range cookers for over 100 years. Renowned for its quality, craftsmanship, reliability and style, the Britannia cooker range is covered by a full two-year warranty and has long been the range cooker of choice for serious chefs. Producing a selection of four main styles of cooker, Britannia offers something for every budget, whether you’re looking for a modern or traditional range style. Britannia cookers are available in four product families, each offering different features and styling. 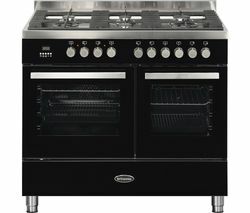 The Q Line and Stanza are great value, while the Fleet and Delphi offer more features that make cooking more versatile. All Britannia ovens feature a grill and have A energy efficiency ratings, complete with triple-glazed oven doors. Larger models have a separate grill compartment as well as two ovens. Britannia range cookers are available in 90cm for small and compact kitchens, 100cm, 110cm, or extra large 120cm models, which feature two large ovens, six burners and a hotplate. Giving you up to two 52-litre multifunction electric ovens, you’ll never run out of cooking space, even for the largest feasts. With up to nine oven functions to choose from, flexibility and choice is at the heart of the Britannia cooker range, with useful modern functions like defrost and pizza settings to make cooking a breeze. An integrated soft-close storage drawer gives you room to store all or your pans and baking trays neatly, while removable glass door panels, roof trays and stay-clean liners make these ovens easy to clean. Choose from gas or induction hobs and a range of classic and modern finishes, including stainless steel, gloss cream and black and red. All Britannia cookers feature electric ovens. 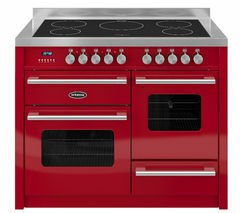 We also have an extensive gas cooker range, and see all cooker hoods to complete your ideal kitchen set up.